The comic book series picks up some time after the cartoon show ended. Long enough for Dib to become, quite literally, fused to his chair. This series continues the strange, silly and sometimes gross adventures of Zim and his attempts to conquer Earth for the Irken Empire. This probably isn't a shock to anyone but I was a huge fan of the original cartoon show. I have the DVDs, a Gir plushie, a Gir hoodie and a Gir keychain (guess my favorite character). So when I found out about the comic books, I knew I had to get them! As it is, I've only been able to read volumes 1-3. I still need to order up volume 4, which I will because I'm just having so much fun with these books! 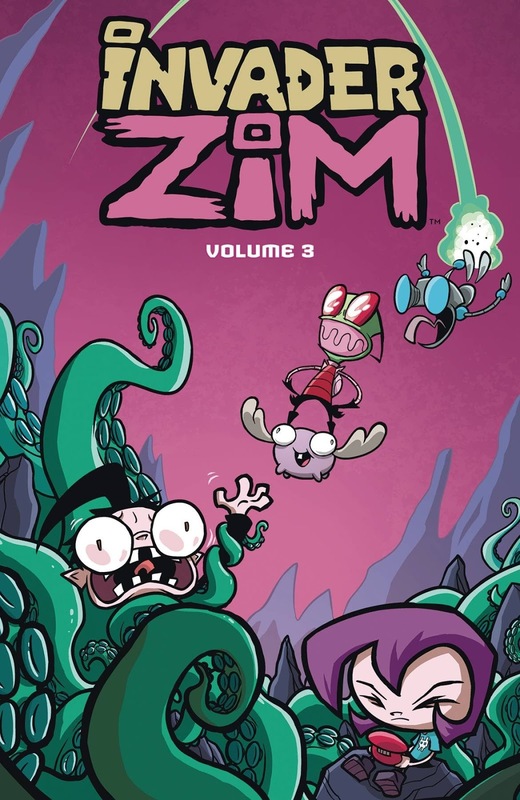 Saying that this series was by Jhonen Vasquez is a bit misleading. He is the creator of Invader Zim but many authors have contributed to these books and it adds a nice element to the world. It was Eric Truehart who made me feel bad for Zim because he clearly just wants the approval of The Tallest more than anything! Danielle Koenig and Jamie Smart's contributions to the possible origins of Ms. Bitters were so cool and helped sell the idea that each kid had their own story. The art style of the books is, for the most part, very close to the original cartoons. Be prepared for a lot of toilet humor. At the same time, though, several artists provide their own little spin that gives each book a unique feel. Each comic, each chapter of the volumes, is its own adventure into the depths of chaos these writers and illustrators find in the world of Zim. If you were a fan of the show, don't hesitate to pick these books up! If you have no idea what the series is, you may have a little trouble getting into the world, but I think the humor more than makes up for that. While I don't recommend it for all ages, I think it would be okay for as young as junior high, maybe middle school aged kids.